MTVG mobile production truck 39 Flex supports UHD HDR with AJA conversion products. Piecing together the right combination of equipment for a mobile production truck is challenging, but establishing a workflow for a 4K/UltraHD high dynamic range (HDR) truck is a whole new ball game, one that Mobile TV Group’s (MTVG) Peter Wehner excels at. As Director of Engineering, Wehner is one of the architects behind MTVG’s 30 mobile production units, which service more than 4,000 sporting and entertainment productions a year for CBS, CNBC, Fox and DIRECTV, among others. Working alongside MTVG CEO Philip Garvin, Wehner helped build out MTVG’s 53’ 4K HDR Double Expando - the first mobile production unit to deliver a live 4K/UltraHD HDR telecast in the U.S. The mobile unit houses 14 AJA FS-HDRs for real time HDR conversion and 4K/UltraHD/HD frame synchronization as well as 12 AJA FS1-Xs and 12 AJA UDCs for HD up, down, cross-conversion and frame-syncing. 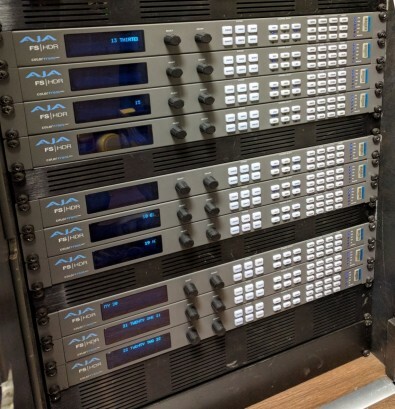 AJA HDR frame synchronizers in the MTVG 39 Flex mobile unit. HDR displays, however, are not standard in most homes yet, so when MTVG delivers an UltraHD HDR broadcast, it simultaneously produces a live HD 1080i or 720p SDR feed, which a majority of the audience sees, in addition to a 1080p HDR feed. Although most of MTVG’s cameras are HDR capable with wide dynamic range, the team also works with a number of SDR sources and camera formats from in-arena POV to robotic or overhead cameras and beyond, making the flexiblity of AJA FS-HDR crucial. FS-HDR’s function on the truck varies depending on the show requirements. One day it may feed and convert a 4K HDR signal to 1080p SDR, and the next day up convert an HD SDR feed to HD HDR, all in real time. A Swiss army knife for 4K/UltraHD/2K/HD HDR/SDR workflows, the AJA FS-HDR bridges real time HDR to HDR, HDR to SDR and SDR to HDR conversion, and enables real time camera log conversions. Powered by the Colorfront Engine, FS-HDR’s extensive HDR and wide color gamut (WCG) processing support facilitates real time processing of a single channel of 4K/UltraHD/2K/HD or up to four channels of 2K/HD simultaneously.